Where no WineBrat has gone before…I am the first one to admit that I am uneducated about most wines outside my sphere of influence; yes I drink them, yes I occasionally enjoy them, but I don’t know much about them. When I was invited to attend Hospice du Rhône this year as a media guest, I jumped at the chance to attend the world’s penultimate tasting event of Rhone varietals. I was jumping up and down for months, and then I got the cold from hell. Suffice to say, Bratty was not amused. As I drove through the endless row of wines between Salinas and King City, and then past the oil derricks and in to Paso Robles, I was more excited about taking a nap and some Nyquil than the bowling event that would ensue later that evening. fortunately, I was domiciled in the hotel that was across the street from the event center, and I arrived early enough in the day, that I crashed out instead of taking in a few tasting rooms. As I rallied with a combination of Rhone medicine and bowling silliness, I was looking forward to the next day’s educational seminars. I am sorry to say that I missed the South African seminar early on Friday morning, but I rallied enough to attend the Côte-Rôtie seminar later in the morning. Côte-Rôtie is located in the northern Rhône, where the vineyards are distinguished by their vertical slop and stone calls. The wine is primarily red Rhône, focusing on Syrah, many co-fermented withViognier. This area has a very different style than the southern Rhone, and winters are wet with a cold wind, as well as fog that can make ripening the grapes a challenge. Wines from Côte-Rôtie share a lot of similarities tot hose of South Africa, and are earthly, gamey and rich. The presenting producer, Domaine Michel et Ogier, is founded on land where seven generations farmed grapes. In 1997, the latest generation arrived after studying in Burgundy to grow Rhône grapes; prior to his arrival, the grapes were sold to a negociant, but that soon began to change. 1982 wasn’t a particularly good year in the Rhone, and the negociant didnt’ want the grapes so the family made their own wine. Soon, the negoicant came back wanting the finished wine, and the winery was born. 2008 viognier de Rosine Vin de Pays showed lemons, necterines, peaches, apricots and honey with crisp lemon rind and peach nectar. The vineyard was planted in 2000, with the first vintage being 2004, and marked a change or the producer. Prior to 1997, when the next generation arrived, only red wines were produced, so the viognier (as opposed to syrah co fermented with viognier) was a departure. It was a cold summer and a difficult year, but this has made the viognier fresh and crisp, with a nice minerality and grapefruit zing. Ogier doesn’t believe is performing battonage, or the stirring of the lees, as this adds a certain fatness to the wine. Viognier possesses its own fatness and structure, and he refrains from battonage to allow the wine to show it’s natural light. 2008 Viognier Condrieu shows the appellation distinctions that occur in Cote Rotie. This example was a much darker golden yellow color, but I had trouble finding the nose (granted I had trouble findnig MY nose but I was hopiung for more obvious aromas in the wine0. The Condrieu is farmed in an area of 6-7 villages, where farms are on steep slopes of old granite based soil; this vineyard i 15 years old, and shows creamier slightly sweeter stone fruit, Meyer lemon, orange blossom, a hint of jasmine, green apple and pink grapefruit. Again, in this example, new oak was avoided to show fresh clean flavors from the wine. Aging in neutral oak with no battonage allows fresh clean wines that are very Alsatian in nature. The rest of the wines, which were red) were lost on my cold, but it was interesting to taste the wines of the area, to compare with my baesline of New World syrah. 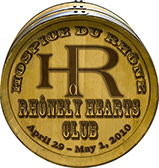 I attended Hospieces du Rhone as a Media guest; however, I paid my own travel expenses and lodging, as well as for most of the local supply of kleenex. I'm a sphere of influence gal myself, but sounds like you got some great exposure to some fab French Viogniers, hope you're feeling better and lucky you! LOL yep, I do love a good viognier It's a great event to do some exploring, indeed! I'm right as rain now, and hopefully no more ickies for a while – just more W I N E! It just goes to show that your body just relaxes when it's time for you to cut loose! Glad you are better and thanks for the reviews. Indeed – I drink a lot of French wine, but being able to go in depth and THINK about it was great!